Who says a dollar bill doesn't go as far as it used to? A new report from the Federal Government says those bills are lasting more than twice as long as they did at the beginning of the decade, and that's upending an old argument about replacing the dollar bill with a one-dollar coin. Here's NPR's Scott Horsley. SCOTT HORSLEY, BYLINE: For years now, there's been a persistent lobbying effort to force dollar coins on the American public. There's even a group called the Dollar Coin Alliance - co-chaired, oddly enough, by a former congressman named Tim Penny. Its argument has been that the government could save money by switching to dollar coins which last so much longer than paper money. And the Government Accountability Office used to agree. 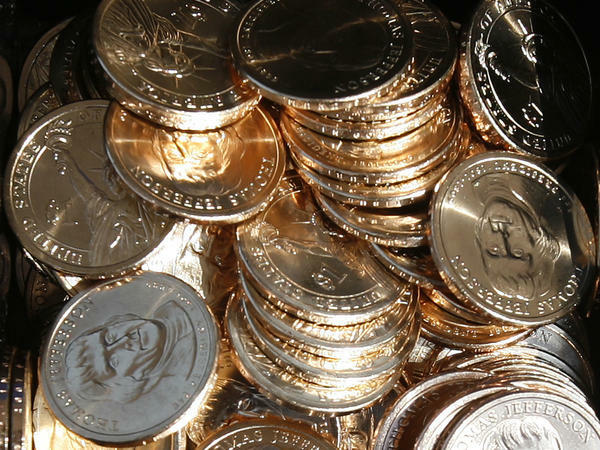 But on the subject of dollar coins, the GAO has flipped. It now says paper bills are more cost-effective. The GAO's John Schumann says that's because paper dollars now last more than twice as long as they used to. JOHN SCHUMANN: When we last looked at this issue in 2011, the paper dollar was only lasting a little bit over three years. And when we looked at this issue again this year, we found that the paper dollar is now lasting almost eight years long. HORSLEY: Schumann says that's partly because of changes in the way the Federal Reserve processes dollar bills. But it's also a sign that, in an increasingly cashless world, paper dollars aren't getting around like they used to. As part of its research, the GAO surveyed lots of industries that might have a stake in the paper-versus-coin contest and found most are not eagerly embracing the switch to coins, even those you might think would have a vested interest. BRIAN WALLACE: Yeah. It's right in our name - Coin Laundry Association. HORSLEY: Brian Wallace represents some 30,000 coin laundries around the country. He says only a handful have retrofitted their machines to accept dollar coins. But just about any other form of payment goes. WALLACE: You could still pay with a quarter. But you could also, you know, pay with a credit card or add value to a card or taking the Starbucks approach of just, you know, waving the phone at the washer and it starts. HORSLEY: Likewise, highway toll booths. NEIL GRAY: Once upon a time, toll roads along with the transit systems and the post office itself were the largest coinage handlers in the country. HORSLEY: Neil Gray of the International Bridge, Tunnel and Turnpike Association says paper dollars can tie up traffic when they get jammed in a toll booth collection box. But that doesn't mean the IBTTA is itching for dollar coins. GRAY: To the extent possible, we've had entire toll road systems eliminate cash completely. HORSLEY: That means dollar bills are lasting longer, and there's less financial incentive for the government to replace them with dollar coins. Anyway, dollar coins have proven stubbornly unpopular with the public. That's why the Federal Reserve has more than a billion one-dollar coins unused in storage. Scott Horsley, NPR News, Washington. Transcript provided by NPR, Copyright NPR.